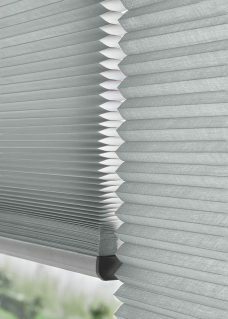 Duette Blinds 64 mm provide energy saving properties owing to the honeycomb pleats. Because of, the honeycomb shape, air is trapped within the fabric. As a result of the blinds insulate during the winter months. At the same time reducing energy costs. In the summer, the fabric ensures a room remain cool. Additionally, also known as thermal blinds. 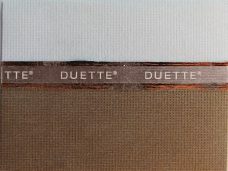 Blackout Duette- Moreover, a silver coating runs inside the fabric. 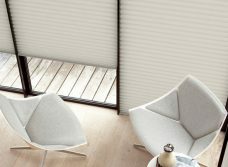 The coating enhances the Duette blackout blinds properties. Notably, the blinds are often called honeycomb or cellular blinds. The Honeycomb blinds look on great on long windows. For example conservatories windows or Juliet Balconies. The videos below are an illustration of the fabrics and NOT Luxaflex branded blinds. NB The bottom up option NOT available on the website. 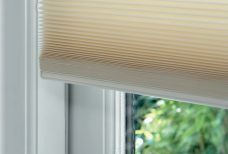 The controls comply with Blinds Safety Regulations being safe by design. With this in mind, the two control options are available. NB Devices along with monitors vary. Even so, order a sample to ensure fabric suitability. 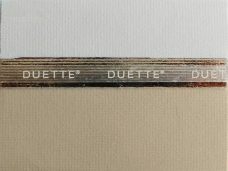 Obtain Duette blinds costs online.